PHOENIX (AP) Even with Golden State’s Stephen Curry, Kevin Durant and Klay Thompson on the sidelines, the Phoenix Suns couldn’t beat the Warriors. 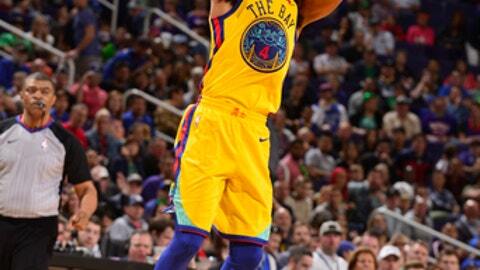 Quinn Cook did his best Curry imitation, scoring 16 of his career-high 28 points in a dominant third quarter, and the severely depleted Warriors handed the Suns their eighth straight loss and 23rd in 25 games, 124-109 on Saturday night. ”This is definitely one to feel good about,” said Draymond Green, who narrowly missed a triple-double for Golden State. Nick Young added 20 points for the Warriors, who beat Phoenix for the 13th consecutive time despite playing without Curry (ankle), Durant (ribs) and Thompson (fractured thumb) – a trio that averages a combined 73 points per game. The Suns didn’t have leading scorer Devin Booker due to a right hand sprain. Green had a season-high 25 points along with 11 rebounds and eight assists for Golden State, which had lost three of its last four after the injuries began to hit. Rookie Josh Jackson scored a career-high 36 points for Phoenix. Troy Daniels added 18. Phoenix led by 15 in the first quarter but was outscored 72-49 in the second half. The Suns outscored the Warriors 30-9 over an eight-minute stretch in the first half to take their biggest lead at 50-35 on Daniels’ cutting layup with 6:52 left. Phoenix led 60-52 at the break. The Warriors outscored Phoenix 29-7 over one stretch in the third quarter to lead 86-74 on Cook’s consecutive 3s with 3:34 left. A 7-0 Suns’ spurt cut it 88-83, and Golden State led 94-85 entering the fourth. Phoenix never got any closer. Cook, coming off what was then a career-best 25 points in Friday night’s home loss to Sacramento, made all six of his shots in the third quarter, three of them 3s. He finished 10-of-16 shooting, 5 of 6 from deep. He is the first undrafted player this season to score at least 25 on consecutive nights. Warriors: Kevon Looney scored a career-best 13 points and blocked six shots, most by an NBA reserve this season. … This season, Warriors are 13-7 without Curry, 8-2 without Durant and 2-1 without Thompson. They are 2-4 without both Curry and Thompson… Golden State’s last loss to Phoenix was Nov. 9, 2014. … Warriors outscored Phoenix 42-24 in third quarter. … Golden State is 9-3 since the All-Star break. Suns: T.J. Warren left the game with 5:19 left in the game with a sprained left knee. … The loss, along with Memphis’ win, gives the Suns the worst record in the NBA at 19-52. … Booker warmed up before the game and decided he couldn’t go. He missed his 17th game this season. … Jackson’s previous career best was 29. Jackson, the fourth overall pick in the draft, has played markedly better in recent weeks. He made 14 of 23 shots, including 2 of 4 3-pointers. Warriors: At San Antonio Monday night. Suns: Host Pistons on Tuesday night.